Holiday happenings can be pretty crappy for the environment. 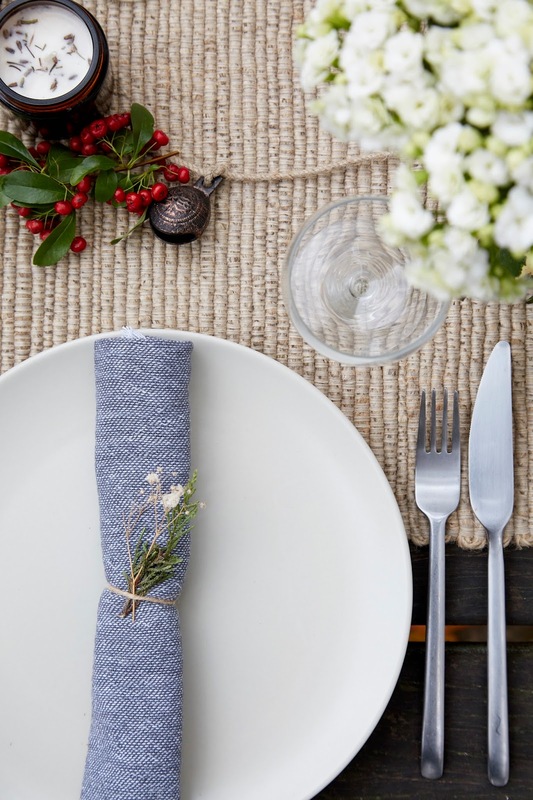 Especially when it comes to large gatherings where paper plates and plastic cups ease their way into the mix out of laziness rather necessity; and absurd amounts of food finds itself wasted rather than eaten. 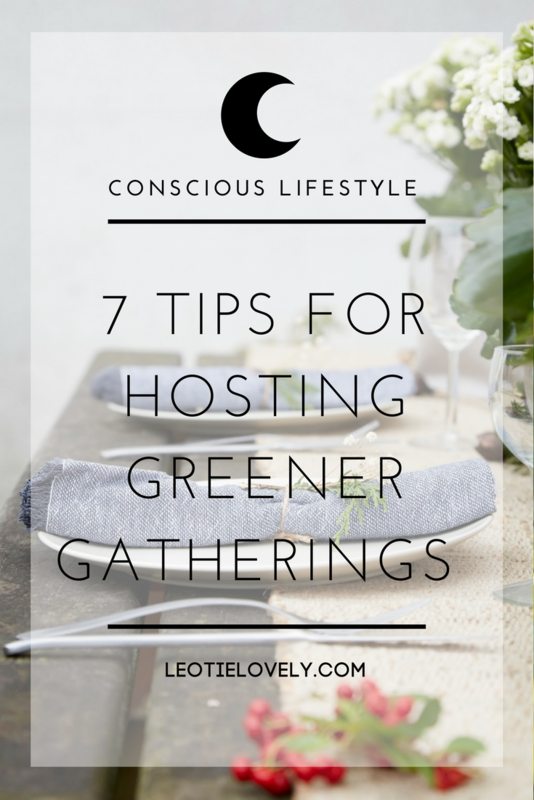 To help lay to rest the issues caused by our traditions, I've put together a few tips to help you green up your gatherings, so you might avoid harmful habits learned and embrace the good instead. Buy food that is in season, organic, and has been produced locally. And while you're at it, avoid packaged goods, especially those wrapped in plastic, at all costs. You'll save money and the environment this way. I'm not a nutritionist or a doctor, so I'm not going to tell you what you should and should not eat; however, by reducing your meat consumption, even to half of what you were eating before (for example, if you're a meat eater and having a turkey or a chicken at dinner, make the side dishes meat-free), you're helping reduce emissions, especially if you're avoiding red meat. If you remove meat from your diet completely, you'd be reducing your emissions by 0.8 tonnes per year. Avoiding meat has been scientifically proven to be the most environmental way to eat, that doesn't mean you have to go vegan, but vegetarian or even flexitarian is an awesome and achievable goal. Use your own plates and if you don't have enough, buy some second-hand ones, you can always re-donate them later. Get each guest to wash their own dishes after the meal, or ask them to load it into the dishwasher if you're worried about more work. Ours are horrible Ikea ones from way back that smashed their way from 6 to 4 before I met him. If you need extra plates, and second-hand ain't your thing, get some Enamel ones (those are the ones we've requested from ole Saint Nick this Xmas) you can use them for picnics, parties and camping as well, they'll never break or chip and they'll last a lifetime. To make one ton of paper towels, 17 trees are cut down and 20,000 gallons of water are polluted. So get some gosh dang reusable napkins. It's better for the environment, for life aesthetics, and for your pocket. 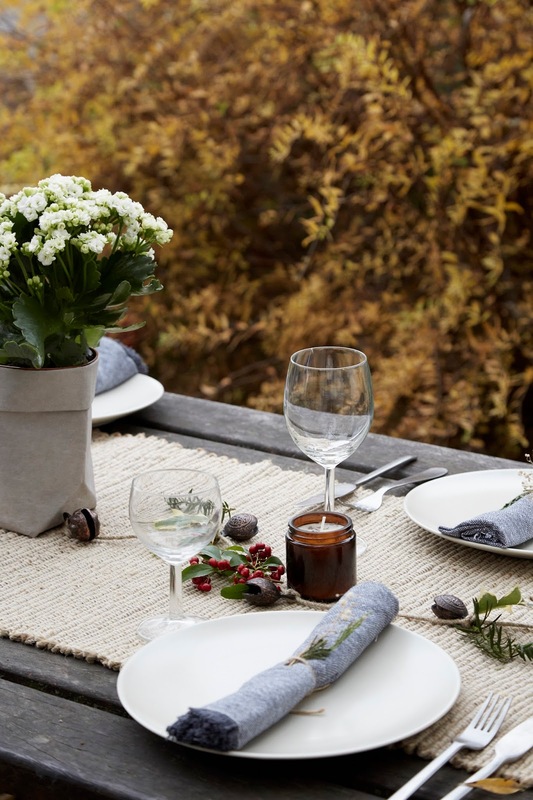 Buying neutral coloured napkins means they can be used daily and get dressed up fancy for any season's table decorating needs. The ones pictured in this post are ethically made organic cross dye napkins by COYUCHI. They don't stain easily (I spilt red wine on mine already and it came right out), and they don't wrinkle when you wash them (see ya later iron). 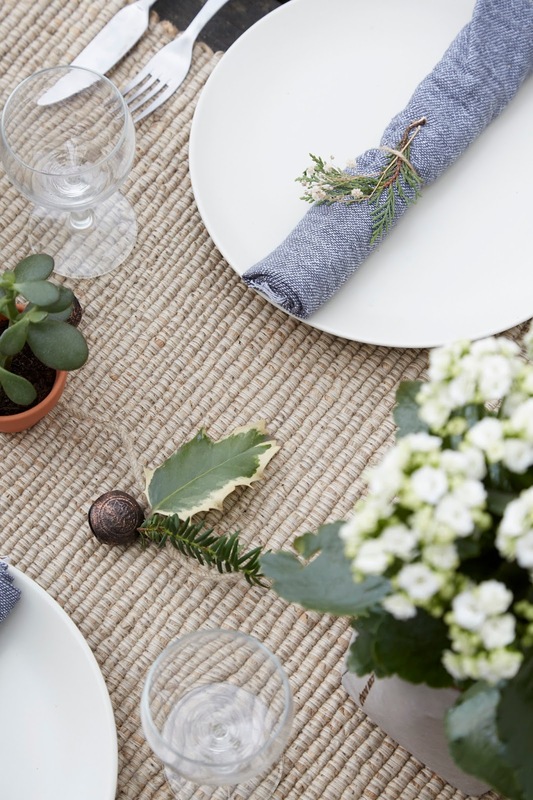 As low maintenance as paper napkins without all the waste. If you live in a country where English is the official language, you can probably get your wine in reusable bottles. Though glass can be remelted almost indefinitely without any loss in quality, recycling glass uses energy and produces loads of pollutants, not to mention the emissions from shipping, or the emissions from the recycling trucks ... so if you can find a local shop to refill your bottles rather than buying, you can drink responsibly in numerous ways. Americans throw away $165 billion worth of uneaten food yearly, and about $277 million of that waste will happen during Thanksgiving. Because our landfills produce methane, which is a more harmful greenhouse gas than carbon dioxide, that's a big problem for the planet and its inhabitants. 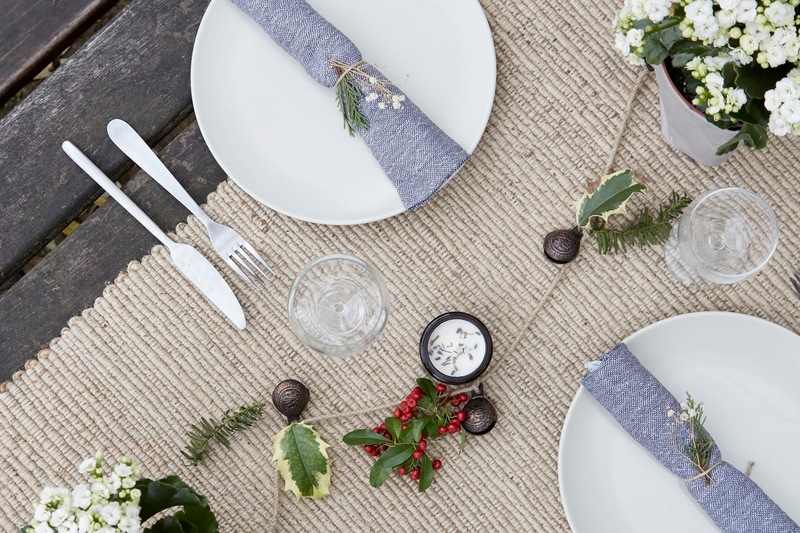 By asking each guest to bring a tupperware to take leftovers home with them, and freezing your own leftovers, you're helping eliminate some of that waste festivities cause. By eliminating food waste from your home completely you could reduce your emissions by 0.37 tonnes per year. 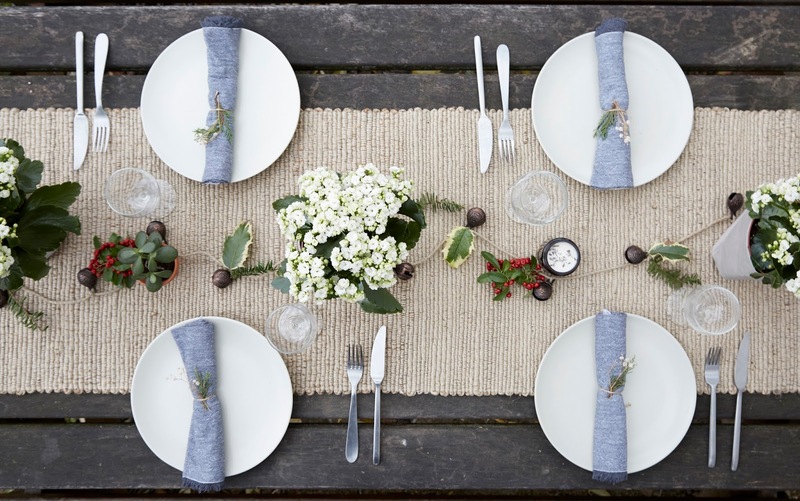 Rather than going out to buy decorations or centrepieces, use what you've got and what nature is already offering. Along with some small cuttings from the bushes and trees in my neighbourhood, I decorated with three extra small sacs from URBANA SACS that I've been using around my house for storage of jewellery, makeup and fruit since they sent them to me and switched their contents out for houseplants to create the centrepieces. I also added in some homemade candles (you can find the 'how to' HERE), a random succulent, and a garland of horse bells I got from TEN THOUSAND VILLAGES which now hangs in our hallway but will dress up our tree next week. 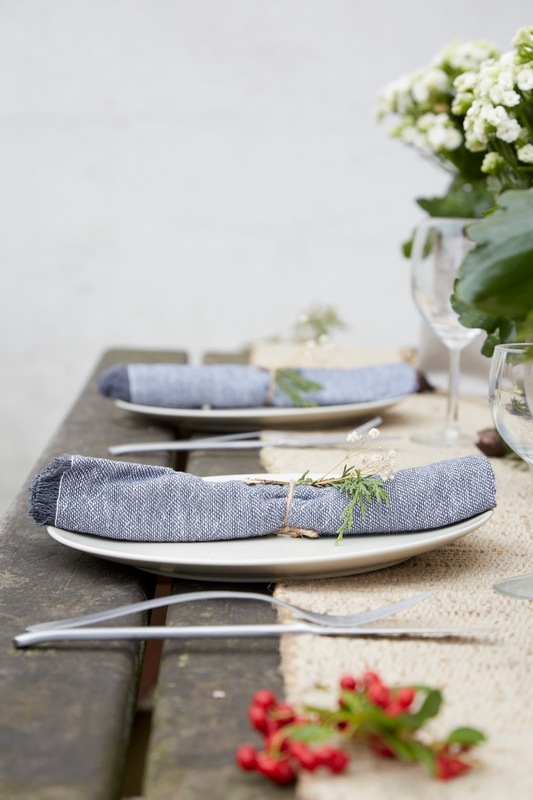 These two-tone organic cotton napkins are easy to dress up for any food bound gathering. They're soft, absorbent and they don't seem to wrinkle, making them as practical as they are pretty. 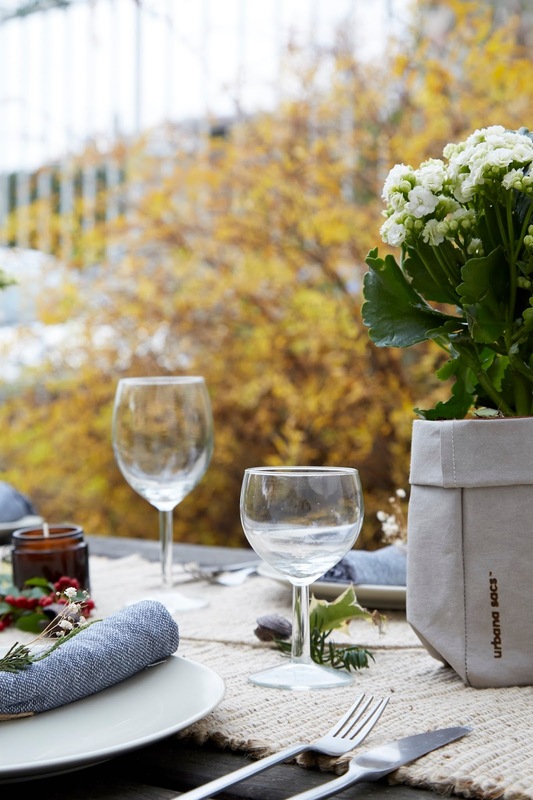 Approximately 98% of the water used to produce these napkins is recycled, and this week Coyuchi is hosting a 'Greener Tomorrow' event where a portion of their sales will go to 1% For The Planet as well. 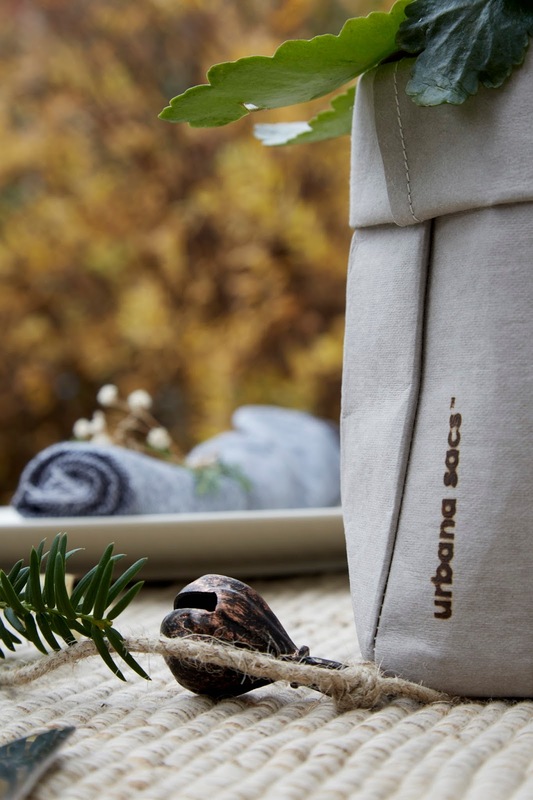 These washable paper sacs are made from sustainable, lightweight textiles infused with a special blend of virgin pulp fibre and recycled felt which is manufactured through cultivation, not deforestation. The sacs are so flexible you can get them wet and reshape them like clay to your needs, and durable meaning you can clean them, reshape them and use them again and again and again. Jute is a rain-fed plant which creates a low-impact, long lasting, strong and versatile fibre, making it great for runners and rugs. This Coyuchi runner is hand-loomed from jute grown in rural India and processed without chemicals. As part of 'Greener Tomorrow', Coyuchi will be donating a percentage of this week's sales to 1% For The Planet. Created with the same brass bells that are used to adorn horses in India, Ten Thousand Village's fair trade partner Noah's Ark helps artisans working from home to connect to markets and sell their work, keeping crafts passed down through generations alive. I've used pretty much every jar we've ever saved to fill our house with candles. Each one made with a simple DIY that I first created for Numi Organic Tea's Blog. You basically just need a big ole bag of Soy Wax (which is more sustainable and safer for your health than paraffin, this bag will make you 6 months worth of candles) and some organic cotton wick. SPONSORED POST: This post was a community post sponsored by multiple brands. As always, the story, including all content, experiences, suggestions and opinions, are my own. I was gifted at least one item for review from each brand listed with a *. 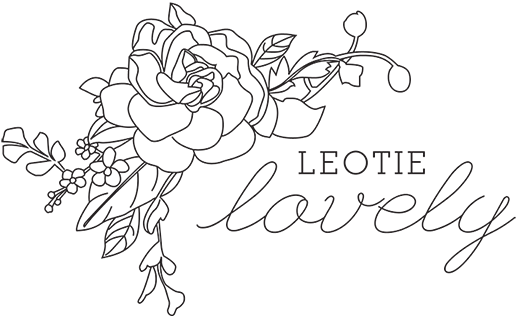 AFFILIATE LINKS: There are a few affiliate links in this post. If you make a purchase by clicking through from the 'where to buy?' links, I may receive a few cents from the exchange. Consider it a sip of coffee from you to me! Looks wonderful & beautiful autumn colours!